protection, an observer on the surface, and a safety harness and line may be required for safe entry. Consult your supervisor before entering any manhole. A duct line and manhole system provide the best available underground system. Such a system allows for growth and permits cost-effective replacement of existing cables or cable terminations damaged by faults or made obsolete by aging. Concrete encasement provides the cables with minimum susceptibility to damage and optimum safety to personnel. Several types of underground ducts are in general use, such as fiber, wood, vitrified tile, iron pipe, asbestos composition polyvinyl chloride (PVC). and concrete. The most common type used today by the Navy is PVC. An underground installation usually consists of several duct lines. Joints between sections should be staggered, so the joints in several lines do not all occur at the same place. To ensure staggering, use starting sections of different lengths at the starting manhole. For duct set in concrete, there must be at least 3 inches of concrete around each line of duct. Where concrete encasement is specified, concrete should have a strength of not less than 2,500 pounds per square inch when cured for 28 days. 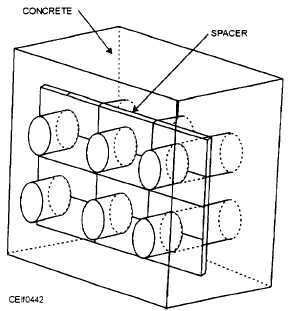 The 3-inch spacing is accomplished by the use of spacers, like the one shown in figure 4-42. The upper lines of the duct must be a minimum of 3 feet below the ground surface. The location of the trench varies according to ground condition. The trench should run as straight as possible from one manhole to the next. To ensure drainage, slope the line downward about 1 foot but never less than 3 inches every 100 horizontal feet. When one manhole cannot be located at a lower level than the other, the tine must slope downward from about the midpoint both ways toward the manhole, as shown in figure 4-43. Dig the trench to the desired depth and tamp the bottom hard to ensure a solid bed for the 3-inch bottom layer of concrete. Spacers can be embedded in the bottom layer of concrete for a depth of about 1 inch before the concrete sets to ensure a solid base. Figure 4-42. - Spacing fiber duct in concrete. Figure 4-43. - Slope for duct run.